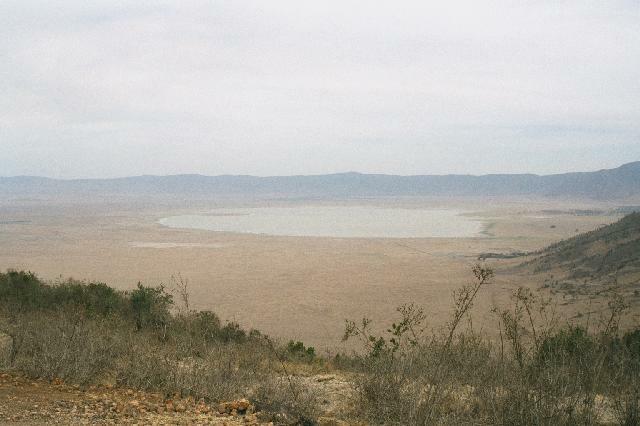 Ngorongoro, pronounced as it is written, is a caldera. Caldera, when translated to english, roughly means a crater which was created by a collapsing volcano. The Ngorongoro volcano, once upon a time, was actually taller than Kilimanjaro. Today with a diameter of 16-19 km this is easily the largest crater in the world. The view that one gets of the crater from anywhere along the rim is absolutely stunning. From the rim, the 265 sqkm large crater bed can be seen dotted with animals and with a closer observation, may be with a help of binoculars, one can not only spot herds of buffalos and wildebeest but also some pride of lions or even rhinos. Ngorongoro is a queer ecosystem by itself. The crater has all the basic elements of a large national park - herbivores, cats, pachyderms, scavengers and needless to say a lake and a small 'forest'. And this very fact that the crater is a separate ecosystem combined with the hand of man is threatening its very existence. The lions for example have been denied their free access to and from the Serengeti plains after the government allowed the Masaai people to inhabit the land around the crater. This obviously has lead to severe inbreeding and the lion population has gone down from about 100 to 45. The hotels around the crater rim are responsible for the lowering of the water level in the lake and this is leading to a slow death of the small forested area in the crater. Rhinos anywhere give a headache to the authorities, but when you have just 15 (all that the entire country has) living in the crater depending heavily on the depleting forest, they make solving the lion's problem seem like a stroll in the park. The elephants face a different kind of problem - lack of mates. For some strange reason, the crater's entire population of pachyderms is comprised of the bulls. In addition to the above, when we visited the place, the authorities had a new crisis to handle - in the form of a buffalo epidemic. For reasons still unknown then, the buffalos in the crater were dying in large numbers due to what looked like a skin disease. There were fresh carcasses every day, scavengers everywhere. Whatever it was that was killing these buffalos, fortunately, didn't seem to affect the other animals. 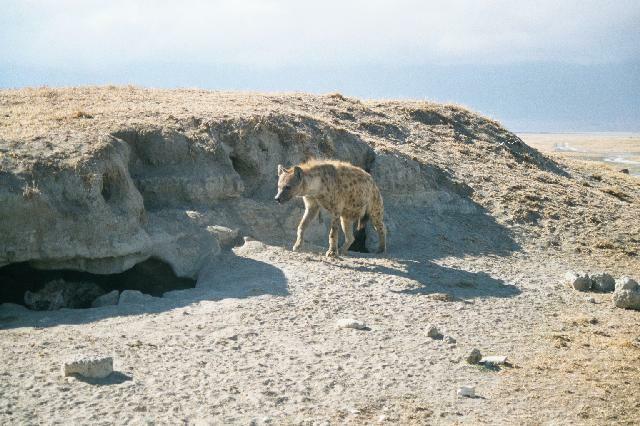 Hyenas, one of the well fed scavengers of the crater, are normally found lying around in puddles. The reason they do that is to cool their bodies; mainly to dissipate the heat generated by the high metabolic rates. The high metabolism is prescribed by their eating habits - a direct result of filling their stomach with bones and other hard-to-digest matters. The Tanzanian government, the park rangers to be precise, should be complimented for taking care of the 15 rhinos in the park. I don't think any other set of people can show better dedication or commitment than these wonderful rangers. A park ranger does a head count of all the rhinos every morning and a ranger along with a couple of Masaai helpers spends every night down in the crater next to the rhinos just to make sure that the poachers are kept away from those USD15 million horns - yes, that is how much I am told the horns are worth! Not only are the number of visitors and the visiting hours strictly kept under control, but their journey in the crater is also kept under strict vigilance by park rangers who keep peering through their powerful binoculars all day, sitting in the huts along the slopes of the crater. The lake at the bottom is filled with pink flamingos and hippos. Hippos, I am told, are responsible for more deaths than any other creature in Tanzania. They, with their powerful jaws and big bodies, have overturned, sunk and broken innumerable boats in the lakes and rivers of Tanzania. Evens lions keep their distance from these huge animals. Crater is also a good place to witness the famed 'queue' of wildebeests, which come to the lake in this seemingly never ending line everyday to quench their thirst. We were also very fortunate to witness a kill in the crater. We saw a hapless zebra falling a victim to a hungry lioness. 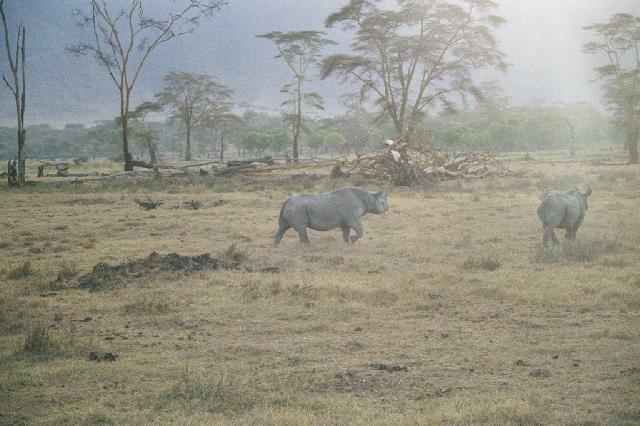 But the pick of the Safari in the crater was spotting 6 of the 15 rhinos of the crater. 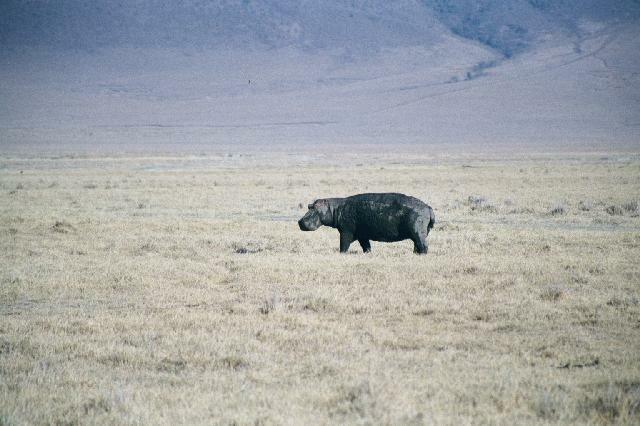 Ngorongoro crater is also the coldest of the 4 parks in northern Tanzania. The rim is at an elevation of 2000m and in case you are camping there, I would advice you carry enough warm clothing. Ngorongoro is strategically situated in between civilization and the great Serengeti plains. 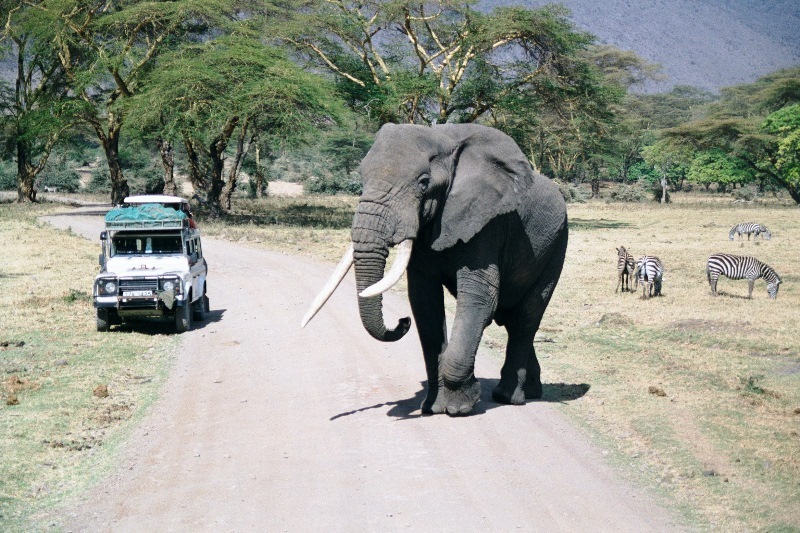 The location becomes more important when you consider that every vehicle going to Serengeti must pass through Ngorongoro and hence pay the entrance fees. Crater, therefore, ends up getting paid twice!